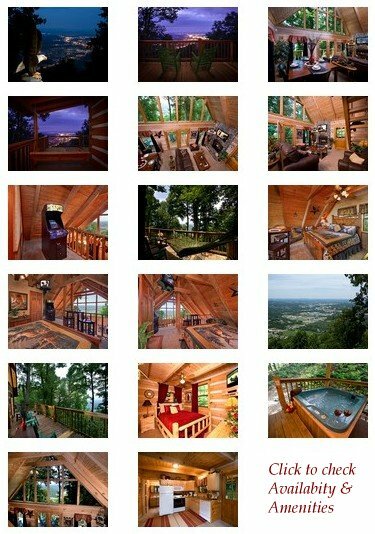 HomeHome /	/ Blog / Smoky Mountains / An Eagle’s View Rental Cabin – Best View of the Smoky Mountains? You can’t beat a cabin that has a 100-mile view of the vast mountain ranges, and also a sight of downtown Pigeon Forge, dazzling in the Christmas season with its millions of sparkling lights, a vastness of another kind! An Eagle’s View is breathtaking. This is a great cabin, one of the newest additions to our family (we’re now up to 330 cabins and growing). An Eagle’s View is a one-bedroom cabin perfect for a honeymoon or a couple vacation, but it sleeps six comfortably, for a larger family getaway. It’s perched high above the hustle and bustle, with a deep feeling of seclusion, and yet it’s only 5 minutes away from Pigeon Forge and Dollywood, and less than 20 minutes from Gatlinburg and the Great Smoky Mountains National Park. Not that you ever have to leave your cabin. Most of our cabins are packed with entertainment features and this one is no exception. Shoot some pool, play the arcade games, work or surf on the Internet, or just soak in the hot tub and gaze out at the world. Never leave. Just stay. And soar above it all with An Eagle’s View! 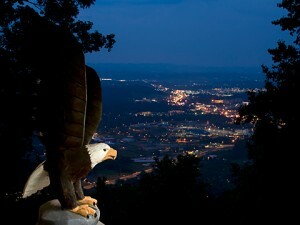 Click here to book An Eagle’s View for your own vacation!